When it’s hay season and you own horses, filling your shed with bales claims a big chunk of time and attention. After a full shift at the day-job yesterday, our priority quickly reoriented to the physically taxing effort of picking up hay bales from two of our main suppliers, one right after the other. On Sunday evening, we hauled and then stacked a hundred bales from our first source. Yesterday, we started the last half of our “work” day with a trip to our second source to pick up one hundred of his bales. As soon as we had unloaded and stacked that batch in our shed, we headed out again to revisit our first source for one hundred more. Once we reached home with that load, we took a short break to eat dinner. Cyndie’s brilliant preplanning to fill the slow cooker with chicken cacciatore in the morning, allowed us to enjoy an instant meal with little in the way of immediate preparation. After some food, it was time to unload and stack the final hundred. It was hot, sweaty, exhausting work. The hay shrapnel ends up everywhere, especially stuck to sweating skin. The dust triggers Cyndie’s allergic reactions. The fatigue increases and the stack of bales gets higher to climb, both at the same time. The joy of completing the task is amplified by the visual of now having enough food for the horses to last most of the year. There’s just one more load needed, and based on the time our supplier was available, we are setting out first thing this morning to do another hundred bales. Last night, after we finished, Cayenne came over to offer me a nuzzle of thanks for our efforts. 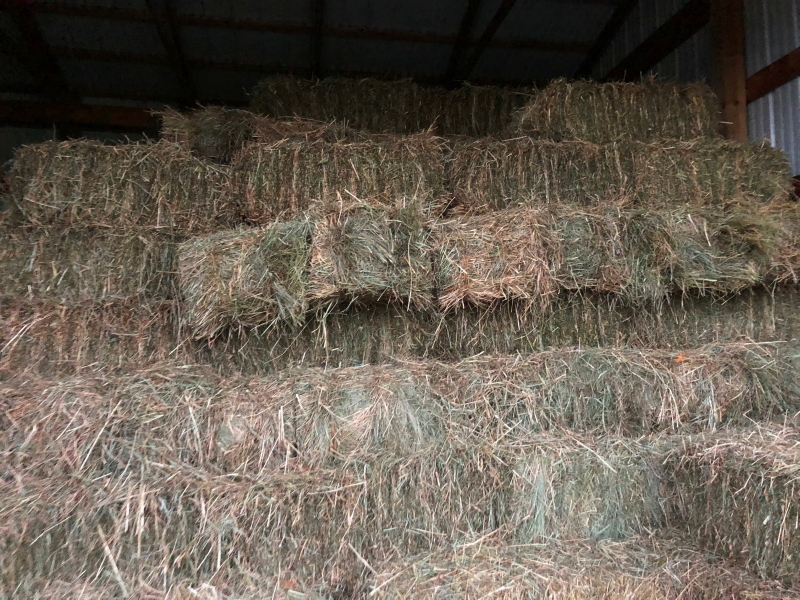 The horses seem as happy as we are, seeing all these bales showing up to fill the hay shed. Cyndie and I will be happier still, when the intense effort is behind us and we can return to our more typical leisurely pace around here. That’s “leisure,” in a relative sense, of course.